• Rejecting "unlawful demonstrations." The Greensboro sit-ins, which involved black students sitting at lunch counters reserved for whites, were unlawful too at the time. 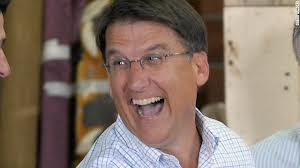 But McCrory, disdainful of those who study history instead of something useful, dismissed Moral Monday protesters because praying, singing and congregating in the General Assembly building violates a trespass law enacted by—the General Assembly. McCrory welcomes "lawful protest," he huffed. "What I don't want is just gimmicks for the media." • No "outsiders," except my outsiders. McCrory slammed Moral Monday again at the state Republican convention in Charlotte in early June, warning that "outsiders are coming in." Shades of the Red Scare! Except that surveys of who's protesting confirm that 95 percent are North Carolinians. On the other hand, millions of dollars spent to elect McCrory and the Republican legislative majorities in 2012 did come from out of state, along with a slew of bad bills from the corporation-funded American Legislative Exchange Council. • What could they want? McCrory told WRAL, "I actually, many times, don't know what [the protesters'] agenda is." Perhaps that's because he refuses to meet with them. For example, when public school supporters came to protest funding cuts, his office said he was busy in meetings and had no time to talk—and at that very moment, a passer-by snapped a picture of McCrory tossing a baseball on the Capitol grounds. • "I Won't Back Down." McCrory claims the Tom Petty song as his theme. Does he realize that the song is about standing up to bullies? "I got just one life/ In a world that keeps on pushin' me around/ But I'll stand my ground/ And I won't back down." It's not suitable for a long-pampered governor whose party has veto-proof majorities in the General Assembly and is pushin' the neediest down. • It's too complicated, #1. Last week, McCrory signed legislation repealing the Racial Justice Act, repeating Republican complaints that the law was "seriously flawed." The RJA allowed judges to determine whether racial bias drove a jury's decision to sentence a murderer to death rather than life in prison. Saying it was flawed suggests you could do better. So where's your RJA, Governor? • It's too complicated, #2. Earlier, McCrory allowed a bill to become law without his signature that would seize the Asheville water system from the city government, controlled by Democrats, and hand it to a new regional authority controlled by Republicans. His reason for neither signing nor vetoing the bill, according to a statement, was that it "raises complicated inter-governmental issues," which he'll leave to the courts. • It's too complicated, #3. McCrory and other candidates, mostly Republicans, took campaign contributions totaling more than $700,000 from the sweepstakes gambling industry. McCrory says he's against sweepstakes gambling. But although a prior General Assembly passed a law against it and the state Supreme Court upheld the law in December, McCrory's Department of Public Safety hasn't cracked down yet. "I'd like the laws to be enforced," McCrory told The Charlotte Observer recently. "The problem is, the industry keeps finding loopholes." • It's too complicated, #4. McCrory last week issued five goals ("pathways") for education, including one telling school leaders to find "more innovative methods to increase teacher pay." Republicans in Raleigh, including McCrory, are cutting state aid to schools. How is that innovative? • Privatize to save money? After rejecting Medicaid expansion under Obamacare, a decision that will cost the state an estimated 26,000 health care jobs, McCrory wants to turn Medicaid administration over to private companies that will take their profits off the top. Privatization is how Mike Easley's administration wrecked mental health care in North Carolina. But why learn from history? • Will talk for cash. McCrory will powwow with contributors tomorrow and Friday at an event in Greensboro hosted by the Renew North Carolina Foundation. Get two tickets for $10,000, or join for $25,000 and the tickets are free! It's for a good cause: social welfare for Republicans. Give them enough money, and they won't back down.